Yes it does get hot here in Israel. Today I got to experience some great firsts in my life. 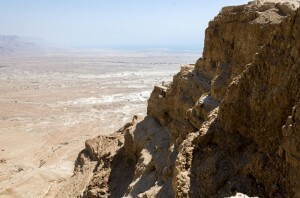 The first was to pass by the area known as Qumran. One of my best professors at Duquesne was Dr. Marylin Schaub, her and husband Thomas were on the teams that discovered the scrolls in caves. The Dead Sea Scrolls are a collection of 972 texts consisting of biblical manuscripts from what is now known as the Hebrew Bible and extra-biblical documents found between 1946 and 1956 on the northwest shore of the Dead Sea, from which they derive their name. 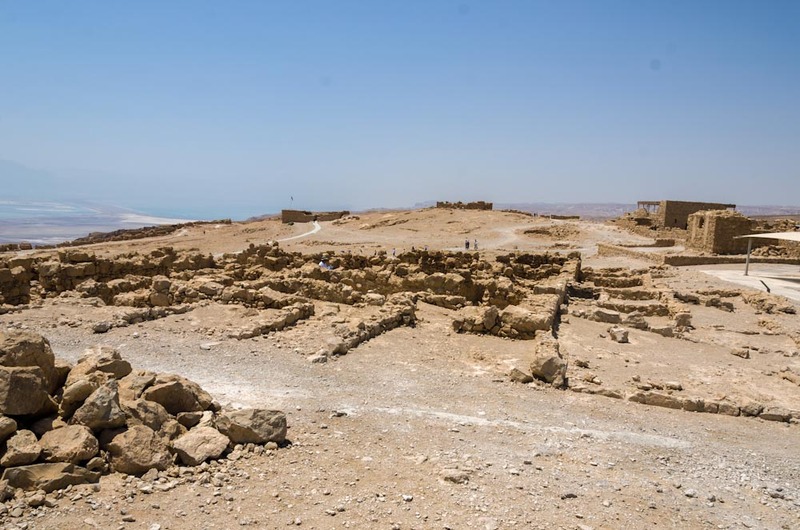 They were specifically located at Khirbet Qumran in what was then British Mandate Palestine, and since 1947, what has been known as the West Bank. 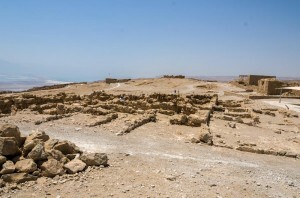 Since the discovery of the Dead Sea Scrolls extensive excavations have taken place in Qumran. Nearly 900 scrolls were discovered. Most were written on parchment and some on papyrus. Cisterns, Jewish ritual baths, and cemeteries have been found, along with a dining or assembly room and debris from an upper story alleged by some to have been a scriptorium as well as pottery kilns and a tower. The scrolls were found in a series of eleven caves around the settlement, some accessible only through the settlement. Some scholars have claimed that the caves were the permanent libraries of the sect, due to the presence of the remains of a shelving system. Other scholars believe that some caves also served as domestic shelters for those living in the area. So it was a real treat to be in Qumran. 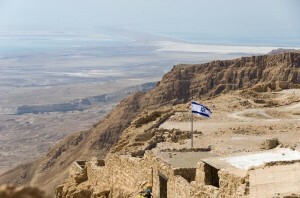 The next location was one that I would have never thought I would visit, Masada. 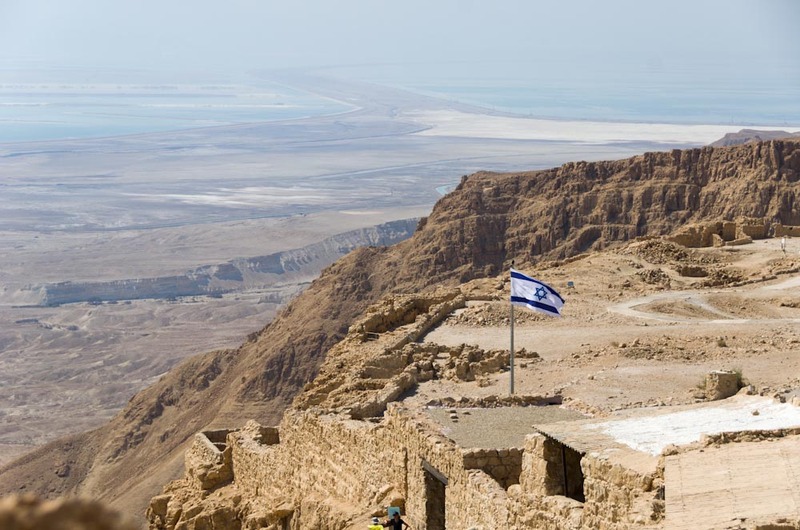 Masada, the ancient fortress built by King Herod the Great atop a lofty natural plateau overlooking the Dead Sea is one of those great locations. The assent can be by the foot path (something that must be in the early day to avoid the heat) or by the cable car. I have recorded two videos, the first was shot with my Nikon D7000. I have speeded up this video. The second is the decent down, for this one I attached a GOPro Hero camera to the window of the car. I shot lots of stills, and some video with the Nikon, I did not take the HPX370 to the top. 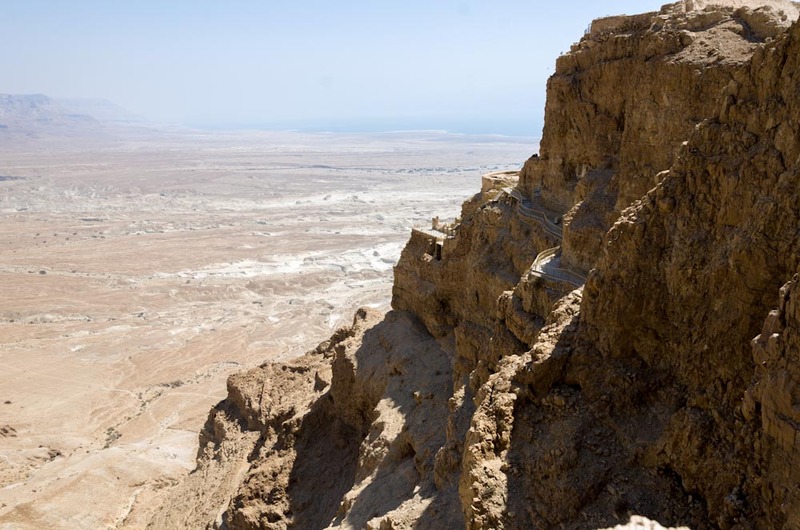 I discovered when I got to the top and was climbing around the top of Masada, I made a wise decision. The heat is almost beyond description. I think I captured the video of the group well, and several still videos including some panoramas. I wanted to “look cool” with my camera on Masada, but looking cool I would not have looked covered in sweat. For those of you who want history, the site preserves a grand first-century Roman villa, the remains of the most complete Roman siege system in the world, and tells the story of the tragic events leading to the last chapter of the Great Revolt of the Jews against the Romans, the last stand of the rebels who became a symbol of the struggle fight for freedom from oppression. 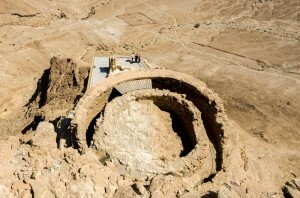 Herod the Great is renowned as the builder of Masada. The plateau’s natural defensive attributes vertical cliffs some 400 meters above the Dead Sea – were not enough for the builder-king, and he fortified the plateau further, with a casemate wall and towers. But he also saw to the site’s creature comforts, building large and small palaces, a bathhouse, storerooms for food and drink and many other amenities. Speaking of water, there is ample water stations and I would advise you to drink lots of water. I think I drank 3 bottles. The Northern Palace is Masada’s most impressive structure, constructed against the northern cliff-face as if hanging over the abyss. It is built on three rock terraces, each containing grand rooms and supported by gigantic retaining walls to expand their size. I have some pictures here to show the view from the top and from the side. One note, for those who just can’t do without fast food, there is a McDonalds inside the museum/gift shop, and no I didn’t go for the Masada McDouble. We had a chance to swim in the Dead Sea. The Dead Sea has no outlet. The high salt content makes any plant and animal life impossible. The high concentration of salt is caused by the high evaporation rate, which has, over the years, led to the build up of salts. The Dead Sea is the lowest place on earth, roughly 1,300 feet below sea level. It is 34 miles long and varies between 11 miles and 2 miles in width. The Sea is 1,400 feet deep. 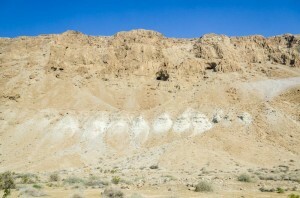 The area is best known, however, for being the site of the biblical towns of Sodom and Gomorrah. Well those have been the challenges on this trip to Israel. I can say without an assistant this job is tough, especially fro an old guy. Many of the young teachers on this trip have helped carrying the tripod, that made it a little easier however nothing can replace a assistant who is dedicated to this job. The teaches on this trip are here to learn, not to be my assistant, but i do appreciate them. 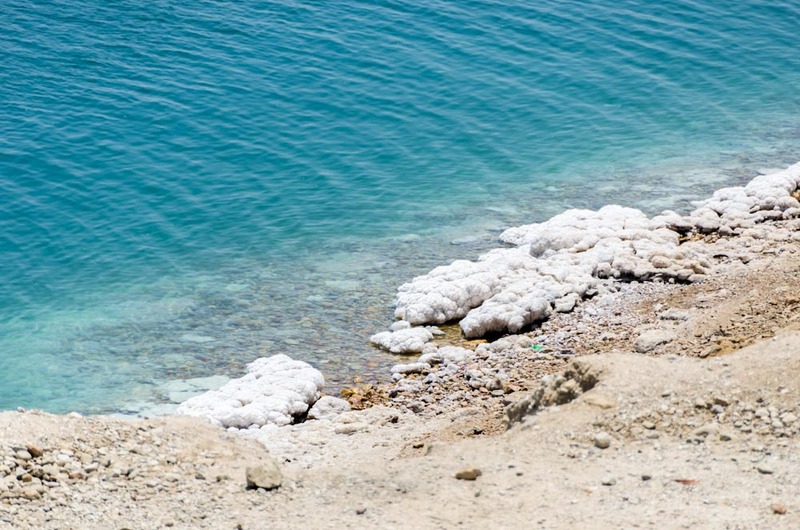 The water in the Dead Sea looks so refreshing!